“Mama, are you going to sing?” We had driven onto my husband’s college campus a few days earlier and he had sung his college song. Now it was my turn. “I can’t. I’m going to cry.” I stalled by searching for the words on my phone. Having sung in the choir for four years, I know the tune by heart, but only remembered the first two lines of words. 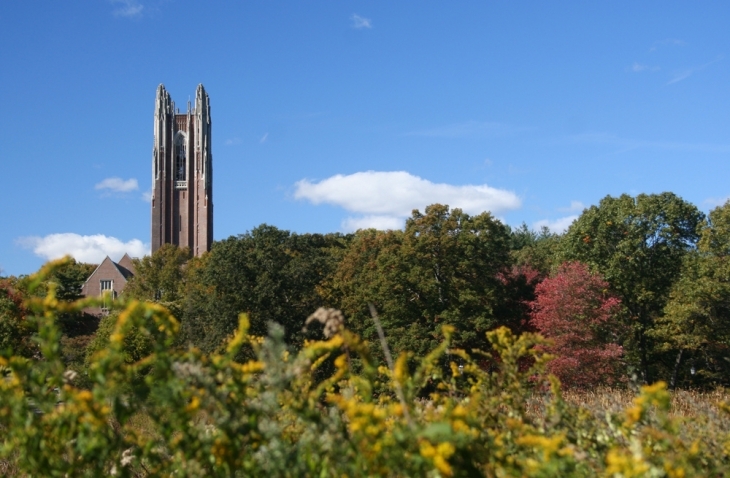 I started to sing, “To alma mater, Wellesley’s…” but choked up on the next word. My husband, two children, and I were driving through “the Vil” (as we used to call it) to visit Wellesley. If you’d told me when I graduated in 1997 that it would be 21 years before I stepped foot on campus again, I wouldn’t have believed you. Surely, I’d make it back sooner than that for a reunion, at least. But here I was, over two decades later, calling up a mental map of campus and trying to match it with what I saw. How far off the main road is the Science Center? I could still walk there in my sleep, right? There’s Alumnae Hall, but there only used to be a surface parking lot next to it. Now there’s a parking structure and a new building. I choked up again when we met my thesis advisor and mentor, Biology Professor Emerita Marianne Moore, and tried to wrap my head around the “Emerita” in her title. How could she be retired already? She certainly looked the same to me. Her voice, mannerisms, and boundless, focused energy were so familiar, despite the fact that we had only communicated through annual holiday cards and emails. I was surprised by the deep emotional reaction I had to being back on campus. Yes, I loved my time at Wellesley. I loved the brilliant faculty who were devoted and accessible to the students, the beautiful campus, and of course my treasured friends. Still, I haven’t been the most devoted alumna. I give to the annual fund and read the magazine but haven’t attended a reunion and dropped out of local alumna group activities after my first child was born almost 12 years ago. Being on campus stirred a deep and unexpected familiarity and sense of comfort. It also filled me with gratitude. Over the last two decades I’ve said good-bye to my childhood home, watched parents, aunts, and uncles age and pass away, and taken a child through multiple surgeries. I’ve moved across the country and feel the constant pull of heartstrings with family and friends spread across the country and globe. As I age, I feel the tenuousness of life and loved ones more acutely and can only expect it to intensify as time marches on. The best-case scenario—that I outlive my parents and my children outlive me, that my loved ones live happy and healthy lives until their peaceful deaths—is not only fraught with pain and heartache, it’s a smooth path that I now know is not granted to most. Visiting Wellesley filled me with an unexpected warmth and gratitude that no matter what else happens, I’ll always have a place to come home to as a sister and a daughter. All together join and sing. Let your happy voices ring. Love her tow’rs and woods and lake. Oh, changeful sky, bend blue above her! Wake ye birds, your chorus wake! Blessed fount of truth and love. Answer to her every call.